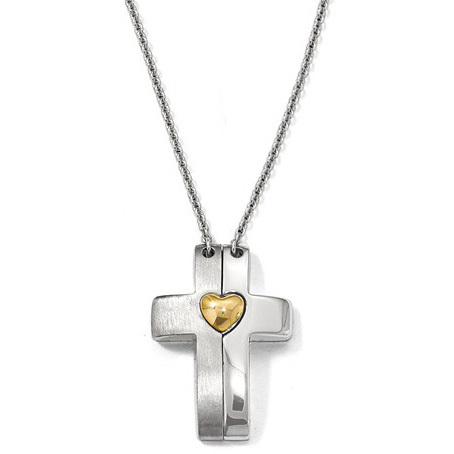 This unique magnetic cross and heart silver and gold-plated necklace from Apples of Gold Jewelry combines both .925 sterling silver and gold plating to create a two-tone cross necklace with a unique twist. The cross, which measures 20mm in width by 27.25mm in length, has one half satiny in appearance and one half highly polished, has a gold plated heart in the center that holds the halves together. The chain is 22 inches in length, and is taken on and off by clasping and pulling the halves of the cross apart. Two hearts adorn the necklace chain that is included. We guarantee our Magnetic Cross and Heart Silver & Gold-Plated Necklace to be high quality, authentic jewelry, as described above.